NEW YORK -- This week has been dubbed, "The Bekah-ning," due to Arie finally finding out Bekah's age. They have a 14-year age difference, which the other ladies think might not go over very well. Chris Harrison showed up to let the ladies know that there would not be a date in LA because Arie left for Lake Tahoe on their first stop on their trip around the world. 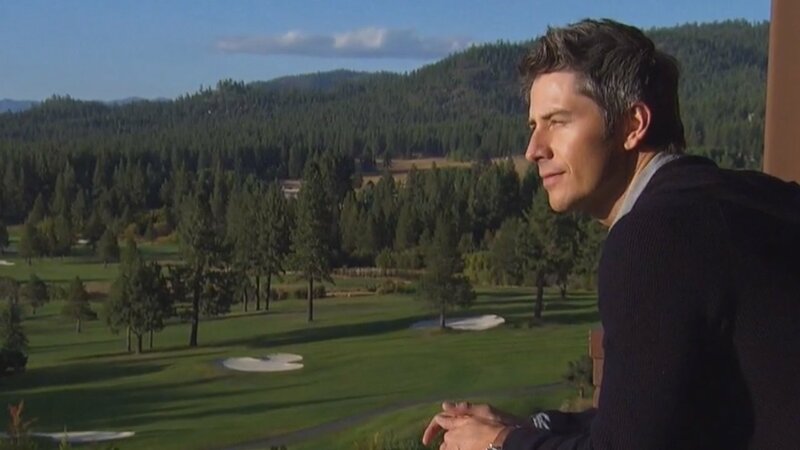 It's picturesque and the perfect setting for Arie to find love. Arie says he enjoys being outdoors and he can't wait to share some dates in nature with the women. As they arrived, the ladies explored their rooms and one was full of taxidermy, perfect for Kendall! Then, there was a knock at the door, and a date card arrived. It said, "Sienne, let's let our love soar, Arie." She got a one-on-one! Just as the ladies were chatting, Arie walked in. He was there to take Seinne on their date right away. They drove off in a pickup truck to a pier where they got on a boat and went parasailing! They dangled above the crystal clear water and took in the breathtaking views. Afterwards, they sat and chatted about their lives and how Arie sees his family every other day, and also about how his little brother got married. It didn't seem like she shared very much about herself just yet, but Arie seemed to enjoy the afternoon with Sienne. Maquel called her mother back at the house and she unfortunately got the awful news that her grandfather died. It was very unexpected, so she packed her bags and left. It remains up in the air if she's coming back or not. Also, another date card arrived, it read, "Chelsea, Krystal, Becca, Marique, Ashley, Jacqueline, Jenna, Tia, Kendall, Lauren, Brittany, and Caroline, Will out love survive?" That meant that Bekah got the other one-on-one date! Back on Seinne and Arie's date, it was time for a romantic dinner for two. Seinne jumped right in and asked Arie why he hadn't been in love in five years. He said it took him a long time to get over Emily, and he dated people who weren't ready for marriage. Seinne finally told him a bit about herself and her family. She said her parents didn't have the best relationship, the hardships of growing up without a love story that featured an African-American woman, and her struggles with love in general. Arie told her that she impresses him so much and that she's so easy to get to know. Arie picked up the rose and asked her if she would accept the rose, and she did! Arie told her he had one more surprise. He took her into a concert by Lanco. They danced on a platform and kissed in front of a crowd of concertgoers. See, he had to know he would be keeping her because what would have happened if he decided not to keep Seinne? No concert? Time for the group date! Arie told the ladies that Maquel had to go home and he wishes her the best. So does that mean she's not coming back? It's still a bit ambiguous! The ladies and Arie met up with two survivalist teachers, Mykel Hawke and Ruth England. You may remember them from the show "Man Woman Wild." The ladies and Arie were told they were going to drink urine, but it was just apple juice. If that wasn't gross enough, then they all ate worms. Ick! Then it started snowing, and Arie went off for a walk with Kendall. They didn't even talk, they just started kissing as Krystal creeped around in the woods. Then Mykel and Ruth gave the group backpacks and maps to find a special destination. There were three teams, only one of which had Arie! The groups wandered around endlessly until Arie's found the oasis first! It had champagne and a hot tub waiting in typical "Bachelor" fashion. Arie put his arm around Krystal in the hot tub, and Caroline and Tia innocently did the same, seemingly to joke about how awkward it is to see that show of affection right in front of them. As evening fell, Krystal got more and more exasperated with the other women getting time and her getting none. Arie pulled Lauren away first to chat and they sat by a fire and cuddled under a blanket. She told him she intends to be open and asked him what he's looking for. He said he wants a true partner and a strong woman. Arie said that he's super attracted to her and he even commented, "I think I'm going to have to take you on a date." Kendall told Arie how she travels with a tiny pig, and it made him laugh. Then they did some kissing. He said she's not like anyone else that he's ever met. He also feels that their chemistry is off the charts. Meantime, Krystal complained to the other women that she doesn't get enough time, when she was lucky enough to have Arie in her hiking group. Then she grabbed him away for a chat while Tia and Caroline griped about how they can't stand her. Krystal complained to Arie about how she misses him and how she has a target on her back because he gave her a one-on-one so early. He asked her about what was going on. She complained about Caroline and Tia's joking in the hot tub earlier and as they were cuddling together. Krystal cried to Arie about how she hates being judged by the women, and he did his best to reassure her. Then, Krystal pulled Tia and Caroline aside and called them out for joking about her and Arie in the hot tub. They said they weren't making fun of them and that Krystal has been hurting their feelings the whole time. Tia went back to Arie to defend her character. She didn't even want to have to talk about Krystal, but she had to because it was brought up to him. Arie reassured her that he believes her and that he "has a plan." They kissed and all was well again. Arie went back into the room full of women and picked up the date rose, he gave it to Tia! Krystal was beyond confused and upset. At last, the main event, Arie's one-on-one date with Bekah. They went for a horseback ride as Arie talked about how wise and mature she is. While that may be true, her mom haircut isn't indicative of a 30-year-old woman, she's 22 Arie! They do have a great time together and seem to get along flawlessly. They got into a hot tub, sipped champagne and just enjoyed each other and the setting. He told her about how he rolled his vehicle and ended up with a screw in his collarbone, and she said "eww!" when she touched it. But, he really does seem to want her to learn as much as possible about him. Later, Bekah and Arie had a private dinner by a roaring fireplace. They talked about how easy it is to talk to each other and Arie told Bekah that he values her honesty. Arie told her that she intrigues him. He told her that he has a few things on his mind with her, he wants to know if she would be ready to make a commitment to him. She said she's never been in the right place with the right person, and he fears that she is where he was in his 20's. He wanted to know if she still likes to go out a lot because he's not into clubbing anymore. She told him she gets up to climbing in the morning so she gets up with the sun too. Then, she stopped and told him that she's 22. He said, "Oh my God, 22, you are so young!" He asked if she's ever dated anyone in their 30's, and she said not seriously. He is just really worried that she's too young for him. He said he can see himself falling for her, but could equally see her not being ready. It's one thing to date someone while you are young through high school or college and know each other, but in this setting, it's just a few weeks and then you are asking someone to make a lifelong commitment. Arie is very worried that Bekah isn't ready for that. Bekah told him that her sister got married young and her parents did too, he said he appreciates that but he's really concerned. She said that she can't give him assurance about the future when she doesn't know the future. Arie told her that she's "maybe one of the most incredible people he's ever met," but he really doesn't want to end up heartbroken. But really, that could happen with anyone. Any one of these ladies could decide tomorrow they aren't ready despite their age. Arie said he's not there for a 22-year-old girlfriend, he wants to find a wife. Arie picked up the date rose and said that he's worried and scared about their age difference, but he feels connected to her and she is so much of what he's looking for, so he offered her the rose! Bekah said "Yes!" Arie said he will "proceed with caution." It was time for the cocktail party before the rose ceremony. Krystal was freaking out because she didn't feel confident going into the rose ceremony. She was annoying the women so much by saying a bunch of dumb stuff about relationships in general and making the most of their time. Surprise, surprise, Chris Harrison showed up and told the ladies Arie didn't want a cocktail party and that he's already made up his mind. Before Arie could start to hand out the roses, Krystal asked Arie to go off to talk. She wanted to tell him that she's got a strong connection with him and that she didn't want to talk poorly about the other girls because she "adores and respects" them. She reiterated that she respects him and she's there for him. They went back to the other ladies and resumed the rose ceremony. That meant that Caroline and Brittany were eliminated. I'm going to miss them! They were both pretty funny ladies with positive spirits. Their perfect match must be out there somewhere. "Bachelor Nation" we've got at least one more week with Krystal. Next week, Arie and the ladies travel to Fort Lauderdale. Tia and Arie's relationship heats up as Krystal becomes "unhinged." Apparently, it comes to a head as all of the ladies decide enough is enough, time to talk to Arie.